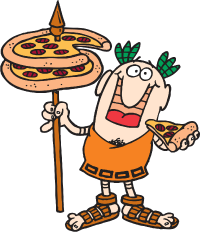 It’s easy to get your Little Caesars Pizza Kit fundraiser started! Register Online or call us Monday-Friday from 8:30 a.m. - 8:00 p.m. ET. We’ll guide you through the process and work with you to schedule your delivery day and time to get you on your way to earning Big! Big! Dough! Your group will earn $6.00 for each item sold! You’ll be amazed at how quickly your profits add up! We recommend actively selling for 2-3 weeks. During this time, your Sellers collect their orders and payment. As customers place their Pizza Kit orders, ask your Sellers to collect payment by cheques made payable to your group/organization. Customers may also order online and pay by credit card*. To get the most out of your fundraiser, be sure to take advantage of our e-mail invites and easy-to-use online sales tools. Allow one week to collect Order Forms from your Sellers. Be sure to gather any late orders. Place your final order over the phone or by logging in at PizzaKit.ca. In ONTARIO, we offer FREE delivery with a minimum order of 200 items. If a group sells 100-149 items, we will guarantee delivery with a $75 under the minimum charge. If a group sells 150-199 items, we will guarantee delivery with a $50 under the minimum charge. We are not able to deliver orders under 100 items. Additional freight charges and delivery restrictions apply in outlying areas. In ALBERTA and SASKATCHEWAN, a minimum order of 100 items is required for delivery. Freight charges apply to all deliveries. Delivery is not available in all areas. Should a group sell under the minimum order of 100 items, but sell at least 50 items, Little Caesars Pizza Kit Fundraising Program will provide delivery service with an additional freight charge. Payment for your fundraiser is due at delivery. The delivery driver will accept payment in the form of a cashier’s cheque or money order. Delivery drivers cannot accept cash, personal/starter cheques or credit cards. Your Kits will be delivered directly to your group in a refrigerated truck. To ensure a quick and smooth delivery, be sure to have your delivery in an accessible area, avoiding stairs whenever possible. Enlist one volunteer helper for every 100 items sold. Schedule your pick up time 1-2 hours after delivery; this will allow you enough time to sort and distribute orders before your sellers and supporters arrive.